President Nicolas Maduro has asked politicians in Spain to leave Venezuela alone in their election campaigns ahead of a general election at the end of 2015, saying he could run for office in Madrid as he is in the Spanish news so much these days. 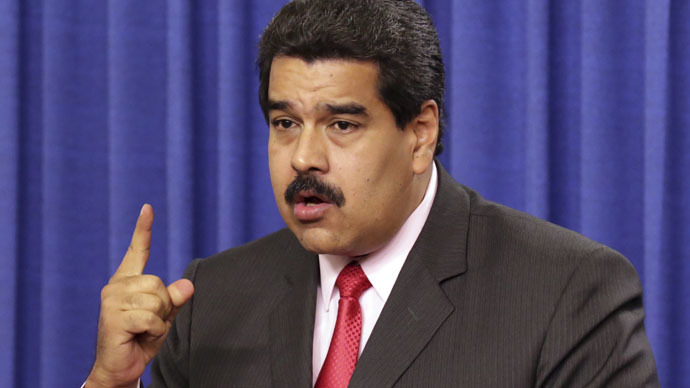 "Venezuela is a country of peace and respect… Stage your campaign in your own country and don’t include us in it, drop your campaign against Venezuela,” Maduro said during his weekly television broadcast on Tuesday, referring to Spanish Prime Minister Mariano Rajoy. “I think I could go to Spain, campaign for prime minister and win, because I’m in the Spanish press and on television more than Rajoy," he joked. Venezuela has been featuring a lot in Spanish media and politics because of links with a new left-wing Spanish party, Podemos (‘We Can’), the Local reports. Podemos, which is a protest party building its reputation on a strict line against corruption, was forced to open its books after the Spanish media reported that one of its leaders, Juan Carlos Monedero, had been doing consulting work for the late Venezuelan President Hugo Chavez and had then dodged paying taxes on the payment he received. Venezuela also hit the Spanish headlines in February when an Eta terrorist, Inaki de Juana Chaos, was found living in a Venezuelan Caribbean resort. Chaos had served just 21 years of a 3,000-year jail sentence but was released on good behavior in 2008. An international arrest warrant was then issued for him after he read out a letter to his supporters glorifying terrorism. After going on the run to Northern Ireland, he was photographed last month in the coastal town of Chichireviche running an off license with his wife and their young child. But Maduro also had a serious message for the Spanish leader. "Mr Rajoy, if you want to be prime minister again, show the Spanish people that you are capable and don’t put us in your campaign, leave us in peace," he said.